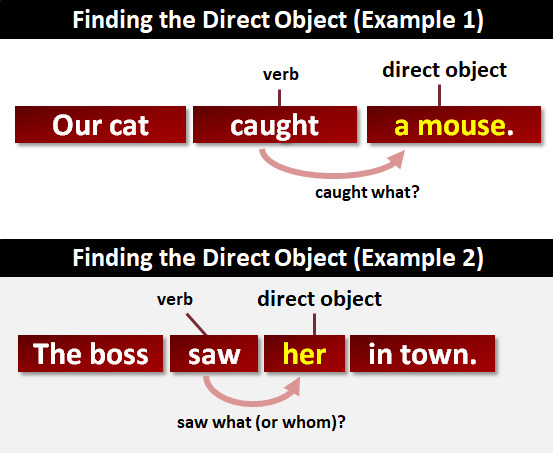 Direct Object | What is a Direct Object? The direct object of a verb is the thing being acted upon (i.e., the receiver of the action). Every actor played his part. The crowd will cheer the President. We can climb the hill and fly the kite. Here is a short video to explain the term direct object. Craig will read the book tomorrow. She thought that the contract had ended. The constable described what he saw at the scene. The cat wants to eat our goldfish. Joan is sleeping at the moment. Take a test on direct objects What is an indirect object? What are transitive verbs? What are intransitive verbs? What are objects? What is an object complement? What is the object of a preposition? What is the accusative case? Take a longer test on direct objects.